Father’s Day always creeps up on me and catches me by surprise!! I was just a little bit late giving my dad his card and present (sorry!!). 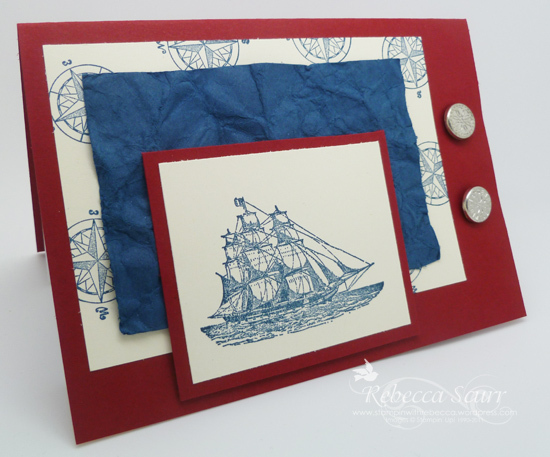 I am so glad that The Open Sea stamp set has carried into the new catalogue. It is a great masculine set. I have cased this card from fellow demonstrator, Kim Stathakos. One of the great parts of being a demonstrator is that you get access to Stampin’ Connection which is a forum for all Stampin’ Up! demonstrators from around the world, which is where I found Kim’s card. I’ve changed it a little as US card sizes are bigger than ours here in Australia. I hope you like it. I’ve used Midnight Muse which is fast becoming my favourite blue!! Although there is a special place in my heart for Marina Mist as well. Wow, I’ve just realised that I didn’t use the Big shot or a punch. That’s a first for a while!! « 2 September 2012 – It’s here!! Beautiful Case…..thanks for the compliment!! !